Always a hit with children whatever the occasion. Give your child a birthday party he/she won't forget! 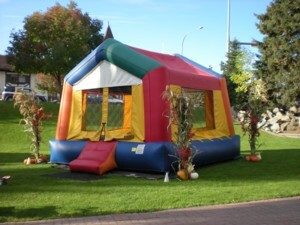 We have two moonwalk bounce houses ready for some serious party action! One is a 13 by 13 foot bouncy castle, and the other is a 15 by 17 foot bouncy house. We set them up on grass only, as we don't want them to get soiled. Set up takes 10 to 15 minutes each. You must have a 110 volt electrical outlet with a 20 amp capacity within 100 feet to power the 7 amp blower. Inflatables are available in combination with our climbing wall only; we do not rent inflatables by themselves. As with all our equipment, Climb for Fun, Inc. personnel will remain on site with the equipment. 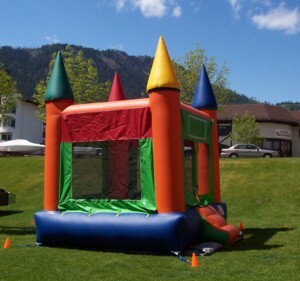 You may want to download Bouncy House Space Requirements & Safety Rules in PDF format. This year we have a brand new caterpillar! It's so new we don't have any pictures yet, so here's one off the manufacturers website. This fellow is quite an attraction, inside is an obstacle course! Entering through the front, children pass over, under, and around obstacles hanging from the ceiling and coming up from the floor. Way cool or what? Features an inflatable floor, a 5 foot tall slide at the rear exit, and side exits every 12 feet. A great inflatable obstacle course to challenge ages 10 and under. He measures 50 feet long with a width of about 6 feet along the tube and 9 feet under the slide. As you can see the caterpillar has a slight curve to it. Set up takes about 30 minutes, including crowd control ropes and signeage. Set up is on grass or indoors only. The location should be free of power lines and low overhanging tree branches. It should be quite level. Sprinkler heads, water lines, underground cables and septic tanks should be well marked so we do not drive our anchoring stakes through them. This unit is powered by two 1hp blowers drawing 7 amps each. You may want to download Caterpillar Set Up and Space Requirements in PDF format fir details.